First things first; thanks for the compliments on my recent finished objects! I blog for myself, but it’s nice to know that someone else is reading it! Right, on to the post proper. Today, the blog is brought to you by the letter “e”. More specifically the mathematical constant known as Euler’s number (this wikipedia page is very good for explaining everything. WARNING: CONTAINS CALCULUS). So, what does this have to do with knitting? This is the start of a knee-high sock striped using the digits in “e”. So I could use all ten integers from 0 to 9 I add one to all the numbers so 0 = 1 round, 1 = 2 rounds and so on. I cast on my usual toe with the yarn I’ll be using for both toes and both heels, switched to my bright yarn, knit 3 rounds (the first digit of “e” is 2), switched to my dark yarn and knit 8 rounds (the second number being 7), and so on. 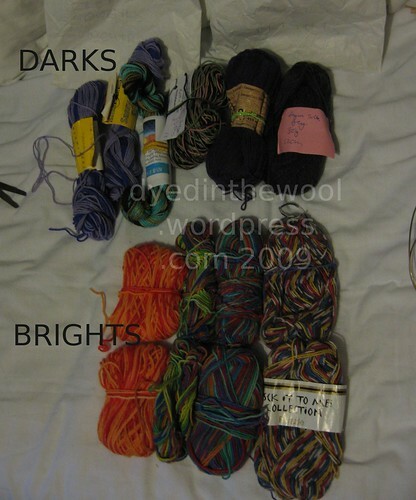 These are all the yarns I’m planning on using for the socks. 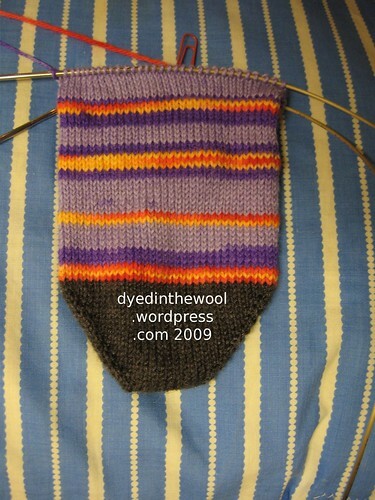 For the second sock, I’ll keep the stripe sequence the same, but change the contrast colours. The pattern I’m going to use is the gusset heel basic sock from WendyKnits (the same I used to make these socks) and this calf-shaping template. 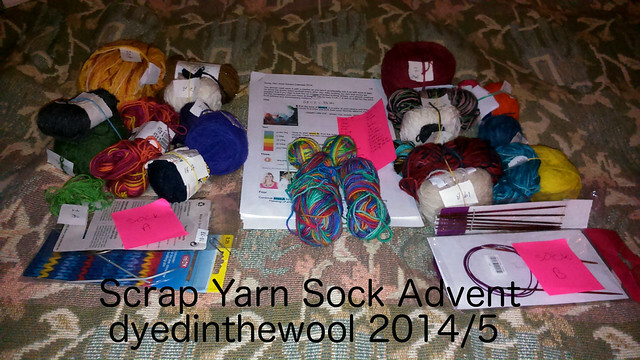 This is my challenge for the December KAL over at the Sock Knitters Anonymous group on Ravelry. And boy is this going to be a challenge! PS: I’ve caught yet another virus (it’s really odd, it feels like ‘flu but not) and I was all up to date with everyone’s blog postings before this. I’ll get there soon, so if you haven’t heard from me I’m still here, but just not necessarily very vocal right now!